These buns are packed full of the umami of meat and vegetables. Each bun is individually made by hand. 300g total (6 buns, 50g each). 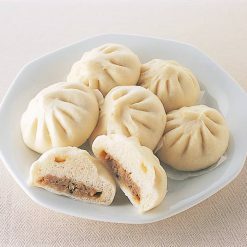 Nikuman, known as baozi in China, are a highly popular type of traditional steamed meat bun. Our authentic nikuman feature the harmonious flavors of meat and vegetables inside of classically shaped buns. 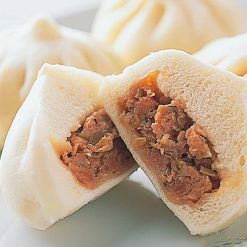 The characteristic little twist at the top is a touch that can only be properly achieved when the nikuman are hand-made. Many other similar commercially available products use baking powder. In addition, Sugarlady’s nikuman are comparatively quite inexpensive: In Chinatowns, 50g nikuman are sold for between 150 and 180 yen each. Steamed buns such as these make great snacks, appetizers, or side dishes, paired either with other traditional-style dishes or with modern fare. Making nikuman from scratch at home can be frustrating as well as prohibitively time-consuming, but Sugarlady’s frozen nikuman can be ready to eat in mere minutes; with very little prep or cleanup to worry about! Our goal is to make it easier for you to serve your favorite foods anytime, even on your busiest days. Set up your steamer. Once it begins producing steam, place the nikuman (still frozen) inside, and steam for about 10 minutes on high heat.Pair the nikuman with karashi-joyu (spicy Japanese mustard soy sauce) or any sauce you prefer, and enjoy! This product contains (Filling) vegetables (cabbage, onions, bamboo shoots, Welsh onions, dried shiitake mushrooms), pork, soy sauce, granulated vegetable protein (soybeans), sugar, sesame oil, oyster sauce, flavoring extract (pork, yeast, wheat gluten, chicken), pig fat, refined sake, table salt, rice wine for cooking, spices (Wrappers) wheat flour, sugar, yeast, evaporated milk, shortening, rice-malt, table salt.. Origin of ingredients: cabbage/pork (domestic). Prepared and packaged in Japan.